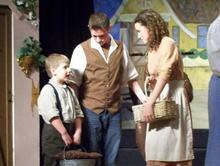 ​With the production of "The Wizard of Oz" in 1995, the Waynesboro Children's Theatre Troupe began its long run of productions. Following "The Wizard of Oz," the next production was "Peter Pan" in April of 1997, the classic story of Wendy, Michael, John, Peter Pan, Tinker Bell and Captain Hook, and their adventures in NeverLand. The next production was "Cinderella" in November of 1998. The timeless story of a young girl and her prince. 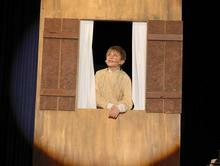 In fall of 1999, "Oliver" graced the stage. Based on the novel by Charles Dickens, Oliver learned the art of survival in the streets of London from the Artful Dodger. "Oklahoma!" followed in the fall of 2000, with such classic songs as "Oh, What a Beautiful Morning" and "Surrey With The Fringe On Top." 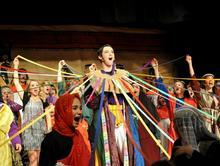 "Joseph and The Amazing Technicolor Dreamcoat" arrived on the stage in November of 2001. Joseph survived slavery and rises in the Pharaoh's Court. Music by Andrew Lloyd Webber and Lyrics by Tim Rice. 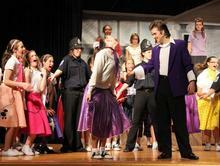 "Grease" came roaring on the stage in the fall of 2002, complete with poodle skirts, sock hops and dragsters. "Annie Get Your Gun" entertained the audiences in November of 2003 with black light dancing, songs and a lively rendition of "There's No Business Like Show Business." "South Pacific" graced the stage in November of 2004, with beautiful songs like "Bali Ha'i," "Happy Talk," and "Gonna' Wash That Man Right Of My Hair." In December 2005, "Annie" sang and danced her way into our hearts with songs such as "Hard Knock Life" and "Tomorrow." Fall 2006 presented "The Wizard of Oz," the classic tale of Dorothy Gale, carried away to the Land of Oz where she meets Tin Man, Scarecrow and Cowardly Lion who prove that true friends are in places one doesn't expect and there is No Place Like Home. 2011 Full of lively characters and entertaining 50's style music. ​2010 - Repeating our success of 2001. A tale of love and forgiveness. 2013 The hilarious story of everyone's favorite Ogre blossoms to life on stage with the help of a feisty princess, a villain with a SHORT temper, a talkative donkey and a village of fairy tale characters! 2009 A timeless fairytale with a beautiful young girl, an unusual Beast and a castle of enchanted creatures! 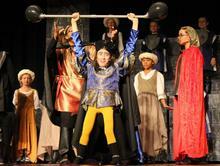 2008 The contemporary production complete with Brainiacs, Thespians, and the very popular Troy & Gabriella! 2007 The enchanting story of a boy who "Won't Grow Up." Wendy, Michael and John joined Peter Pan, and his faithful companion, Tinker Bell, on many adventures with Captain Hook and Tiger Lily.